Charleston is a city located within the U.S. state of South Carolina. Charleston is the administrative center of the county Charleston since its establishment in 1901. Originally the name of the town was Charles Town and it was located along the Ashley River. In 1680 the town moved to its present location - Oyster Point. The city adopted its present name in 1783. In 1690 Charleston was the fifth largest city in North America and remains among the ten largest cities in the U.S. Census of 1840. Charleston's population is now about 120 000 people, making it the second most populous city in South Carolina after the state capital of Columbia, South Carolina. 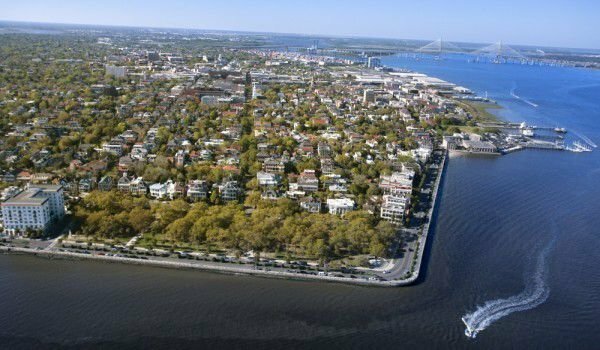 Charleston is the fastest growing city in the state of South Carolina. Charleston is known as the Holy City because of the large amount of churches that are in it. This is because of the fact that the city’s in thirteen colonies preached religious tolerance. Many Huguenots found refuge in the city of Charleston during their persecution. The City of Charleston is located just south of the midpoint of the coast of South Carolina, at the confluence of the rivers Ashley and Cooper, which flow into the Atlantic Ocean. The original name of the city of Charleston - Charles Town, was chosen in honor of the English King Charles II. Since Ireland and Scotland are returned to the English throne under the protection of Sir Oliver Cromwell, the king gave land within the state of its eight Carolina loyal friends, known as the Lords proprietors. Seven years passed before they settle their settlement in the Carolinas. The first settlement of the Lords was Charles Town. The community was founded by English settlers from Bermuda in 1670 on the west bank of the Ashley, a few miles northwest of this city. The location was chosen by Anthony Ashley-Cooper and the city quickly filled with people. In 1680 the town developed rapidly, many people continually arriving. Then the city moved to its present location and became the capital of the colony of Carolina. It became a major center of British settlers in the late seventeenth century. The settlement was often subject to attack by sea and by land. Periodic attacks were made by Spain and France, who still questioned the position of England in the region. They are combined with resistance from American Indians and pirates. While the earliest settlers primarily came from England, colonial Charleston is home to immigrants from France, Germany, Ireland and Scotland. In Charleston live the richest Jewish families in North America. The port city of Charleston became a major center for the transportation of African slaves in the rest of the country. On December 20, 1860 after the election of Abraham Lincoln, the General Assembly of South Carolina voted secession from the Union. For this reason the Union forces repeatedly attacked the city, causing massive damage and almost destroying the commercial traffic. In 1865 the Union troops entered the city and took control. Charleston is starved economically over several decades in the twentieth century, the strong military presence in the region helps the economy of the city. The Charleston hospital strike in 1969 is one of the biggest events of the civil rights movement. At the end of the twentieth century the city was continuously infused with new investments, which changed to better the entire urban infrastructure. Old buildings become historic monuments. They survived Hurricane Hugo. It erupts in the city in 1989 and most historic buildings in Charleston survive. Total damage from the hurricane was over 2, $ 8 billion.